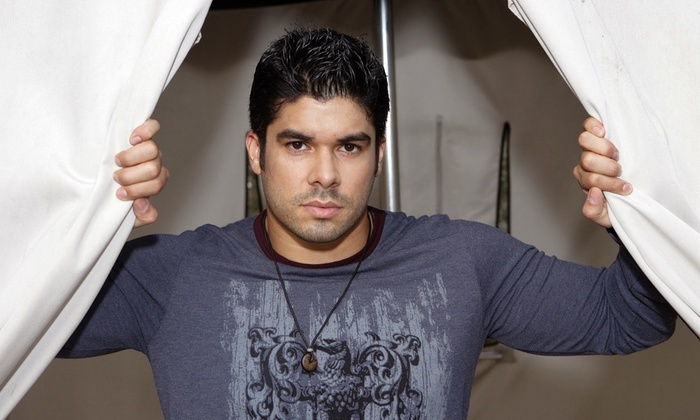 Jerry Rivera is a Grammy Award and Latin Grammy Award-nominated Puerto Rican salsa singer. In 1988, Tommy Olivencia heard Rivera sing alongside his father and recommended that he sing solo. When Rivera was 14, his father made a demo and presented it to the CBS music department. They signed Rivera. Rivera began to be known as “El Bebé de la Salsa” (the baby of salsa) after recording his first album, Empezando A Vivir, . This project generated the hit, De La Cabeza A Los Pies (“Head Over Heels”). His second album, Abriendo Puertas (‘Opening Doors’), produced the hit songs Esa Niña (‘That Girl’), Dime (‘Tell Me’), Nada Sin Ti (‘Nothing Without You’), and Como un Milagro (‘Like a Miracle’) became number one hits first in Puerto Rico, then among the Hispanic populations in the United States and finally across Latin America. His third album, Cuenta Conmigo (‘Count on Me’), won three Platinum Record awards in the United States, Puerto Rico, Venezuela and Colombia. It became the most-sold salsa album in history, a record previously held by Willie Colón, and held the number-one spot in the Latin American Billboards for three consecutive months. Its hit songs included the Cuenta Conmigo, Me Estoy Enamorando (‘I’m Falling in Love’) and Casi Un Hechizo (Neary A Charm). The number one hit for the album was Amores Como El Nuestro (Love like ours) which is considered to be the best song by Rivera. Rivera was awarded two Premio Lo Nuestro Awards for “Singer of the Year” and “Album of the Year” and Sony Records presented him with three Crystal Awards. The introduction of Amores Como El Nuestro was sampled by Haitian-rapper Wyclef Jean in his 2004 song “Dance Like This” from the soundtrack of Dirty Dancing: Havana Nights which would later become the worldwide number-one 2006 hit “Hips Don’t Lie” by Wyclef and Colombian-singer Shakira. However, in the case of Shakira, she was accused of plagiarism since she adapted Wyclef’s sample without Rivera’s consent. The introduction of “Amores Como El Nuestro” can be heard on MTV’s animated series Daria episode “Fair Enough’ of its second season. In 1993, he released Cara de Niño (‘Baby Face’) with ¿Qué Hay De Malo? (‘What’s Wrong About This?’), Cara de Niño, No Hieras Mi Vida as being major hits of the year. In 1994, as his popularity was rising, he released his first compilation album, Lo Nuevo y lo Mejor (The New and the Best), and contained the single hit Me Estoy Enloqueciendo Por Ti (‘I’m Going Crazy For You’). The following year, “Magia” was released with the self-titled album and Ahora Estoy Solo (Now That I’m Alone) In 1996, Rivera released “Fresco” and Una y Mil Veces (One Thousand and One Times) and Lloraré (I Will Cry) were the album hits. Ya No Soy El Niño Aquel was released in 1997. In 1999, Rivera recorded De Otra Manera (‘Another Way’), his first attempt at ballad music, which featured the bolero Ese (Him). Jerry sang the song with his father at the Roberto Clemente Coliseum in San Juan. In 2000, Rivera recorded Para Siempre (‘Forever’). This was his last album on Sony Latin records. In 2001, he released his self-titled album Jerry Rivera and the year after, he recorded Vuela Muy Alto (Fly High) which brought him a new fanbase all over Latin-America and the U.S., with the title track hit the top spot and the top 10 in many charts along with Herida Mortal (Mortal Wound). The following year he returned to his salsa roots and released Cantando A Mi Idolo… Frankie Ruiz (‘Singing To My Idol… Frankie Ruiz’), a tribute album to one of his idol Frankie Ruiz. The album gain him a Latin Grammy nomination, made up for the poor sales of his previous ballad albums, and his major album hit was Ruiz’s Mi Libertad featuring Voltio. Rivera played a small role in the movie I Like It Like That and appeared as himself in a Latin American soap opera titled Mi destino eres tu (‘You are my destiny’) which aired on Univision in the US during November 2005. Rivera has also appeared in various Banco Popular de Puerto Rico productions, including Al Compas de un Sentimiento (dedicated to the late Puerto Rican composer Pedro Flores) and Con la musica por Dentro. The same year, he released Ay Mi Vida (Oh My Life) which had received mixed reviews. In 2007, he released Caribe Gardel, a tribute to Argentine singer, Carlos Gardel with Gardel’s Cuesta Abajo (Downhill) being one of the major salsa hits of the year. In 2011, he released El Amor Existe, with Solo Pienso En Ti being one of the major salsa hits of 2011. Rivera has performed in Venezuela, Colombia, Honduras, Panama, the United States, Spain, Ecuador, Argentina, Peru, Mexico, Sweden, France, and Japan. In 2011 he was one of the four judges for Idol Puerto Rico. (The Puerto Rican Version of American Idol).